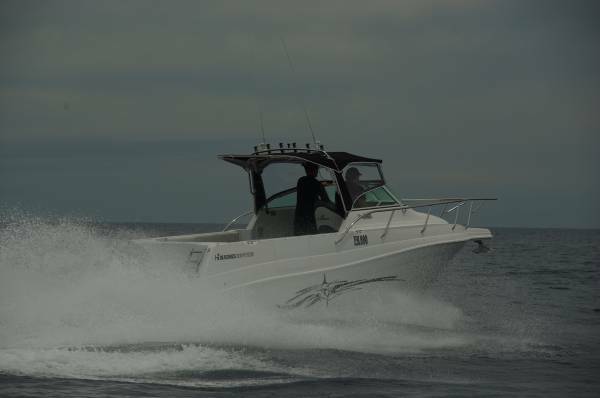 When a boat has the 7.6m length of the Haines Hunter 760R a lot of the compromises typical of trailer boats disappear. 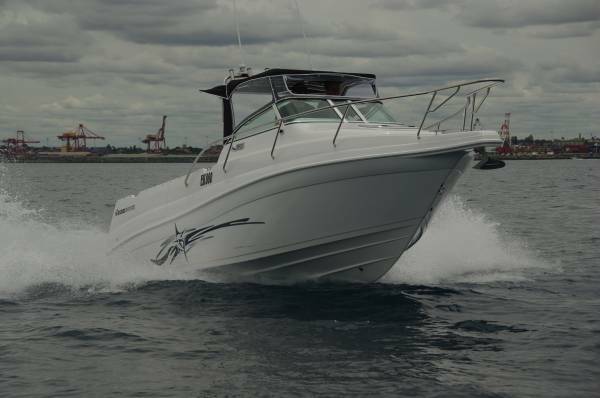 Despite being essentially a roomy fishing runabout, it still has a cabin adults can sleep and stand up in. You can overnight at anchor or use it as your caravan on trips north. It is so unashamedly a fishing boat that as standard it comes with just one seat, although the review boat had been fitted with a removable lounge aft. Clearly, the basic idea is that space is the priority, and few would disagree that no boat ever had too much of that. The size also contributes to an impressive stability, but the weight is kept manageable. Boat, motor and trailer weigh in at 2650kg, so even with the 500L fuel tank full the likes of a Land Cruiser would cope, and a beam of exactly 2.5m means permitless towing.. 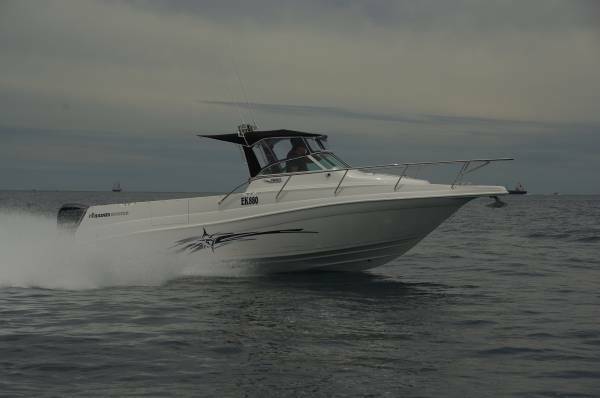 The motor fitted to our boat was a 300hp Yamaha four-stroke, but even with the weight of the maximum twin 225s the same vehicle remains legal. Even with our relatively modest power performance was spirited: 40 knots flat out and very few seconds needed to reach it. This is a boat in which speed will be wanted. A genuine offshore sports fishing boat, and a boat to undertake the long hauls to destinations like the Montebellos; that monstrous fuel tank is there for a purpose. Haines Hunters have few rivals among monohulls for quality of ride, and generally the larger the hull the better: the 760 irons out the lumps and lets that speed be used. Even a dyed in the wool fishing boat has the family on board from time to time, and the 760 is not devoid of refinements for them. Most partners would give the electric flushing toilet the thumbs up, and the drop-in table ahead of the lounge would be welcome. The Bimini gets a removable rear extension to spread the shade, and the carpet that many anglers would rather do without is quickly installed with press studs. The massive 500L catch tank, with the insulation of a fibreglass hull, makes just as good a picnic icebox as it does an ice slurry container, and a 60L fresh water tank feeds a pressure water system. But the features for fishing are far more conspicuous. The bulwarks each have triple racks for gaffs and rods, complementing the coaming sockets and the Targa rocket launchers. There are twin live bait tanks with aerator and pump, a side door for bringing serious fish on board, and the provision for fishing electronics is outstanding. 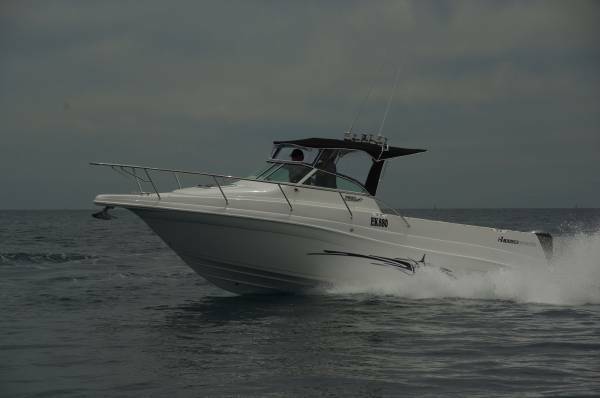 The flat dash angled at 45-deg, on the review boat carries a pair of 8-inch screens, but has enough area for two 12-inchers as well as switchgear, radio and stereo. I liked the side deck-side rail set-up. Certainly you can use the clear fore hatch to reach the foredeck, but the alternative of over the deck is often more convenient if actually possible. It is here, with enough deck width and handholds for safety. Though you won’t need to go there for anchoring: there’s not only a power windlass, but one of the wonderful drum kind not prone to snagging. Back to that cabin: it is spacious enough to be a desirable living space rather than a flophouse of last resort. With almost extravagant volume it is fully lined, has abundant lights, lockers and pockets, and a pair of long bunks that convert to a near-king size double. This is a boat that has had a lot of purifying development. One of the things that said it for me was the placement of the twin batteries. The near standard location is out of sight within the transom; not here. 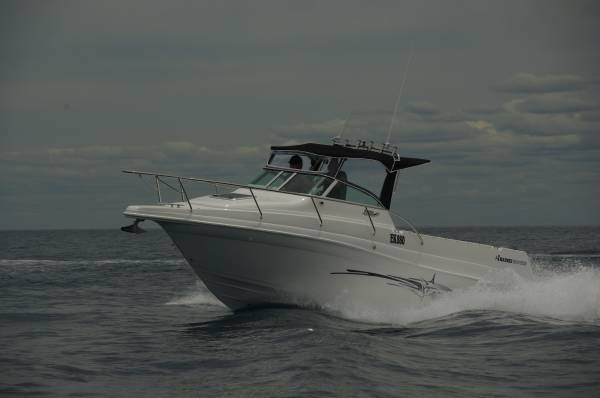 The transom is used for live bait and productive storage; the batteries live at the sides – easily visible and more likely to receive inspection and service.